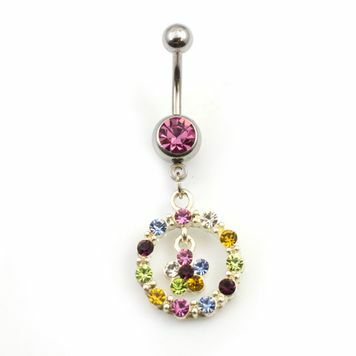 This attention grabbing dangling circle with flower navel ring is made with a 316L high grade surgical steel shaft and rhodium plated dangle with multi-color cubic zirconia jewels. This belly ring is 14 gauge and the length is 11mm-7/16 of an inch. The externally threaded top bead size is 5mm and the bottom is 8mm. Entire piece is nickel free.